Well, I've been teasing on social media all week that I'd be back to blogging... so here is my first post since August. Why did I stop for so long? Quickly, I started a new job, bought my first home, and felt as though if I was going to continue blogging... I needed to update the style. Moving forward, you will find simplified posts that tie back to the description.... achieving a healthier lifestyle. Not all posts will revolve around exercise and recipes... the focus will be on my lifestyle. I hope you enjoy. Moving on, last night I had all of my girls over to catch up, drink wine, and of course, eat. We had a lot of catching up to do which, of course, resulted in a lot of laughs. I prepared a few of my entertaining staples. You'll see where I incorporated healthy options. First, cheese. You can't have a girls night without cheese. 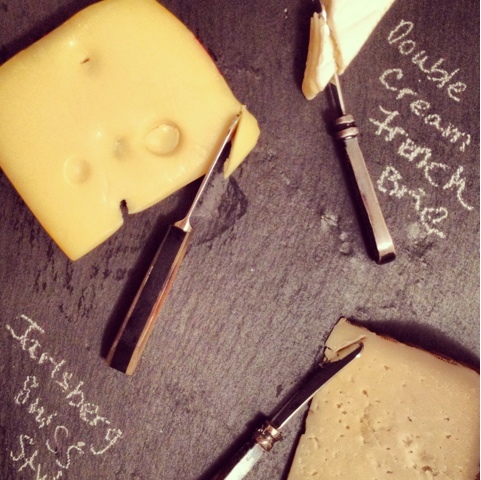 Kim gave me this fabulous slate cheese chalkboard as a housewarming gift and I couldn't wait to use it. When serving cheese, it's always nice to label what exactly is being served. I always include a brie, hard cheese, and a semi-soft. Last night, double-cream brie, Jarlsberg swiss, and manchego were served with a side of fig jam and whole wheat french baguette from a local bakery (fig jam will change your life). The manchego and the brie are pretty much gone. Next, homeade baked potato chips. No need to fry when the oven will do the trick (and so much healthier). 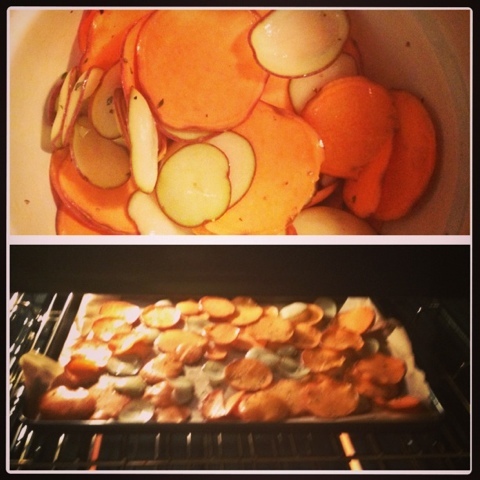 Simply either use your mandolin or thinly slice a variety of potatoes (I used sweet and baby gourmet red potatoes). Soak in water to remove the starches (thanks, Krista for that tip! ), pat dry, douse in o/o, salt, pepper, and thyme (any herbs will do). Bake on parchment/baking sheet for 10-15 minutes. These were a hit and are also all gone. Last but not least, my specialty, antipasto. 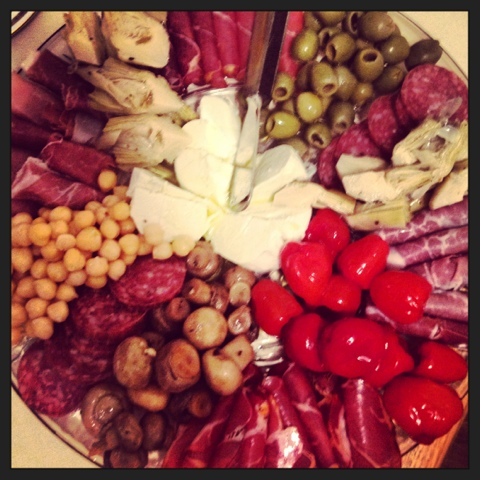 If you know me, you know I am professional antipasto maker. I enjoy every second of putting this together, I put a lot of love into my antipasto. You can use any Italian meats/cheese and marinated vegetables. I always build around prosciutto, hard salami, and hot capicola. The beauty of this is that you don't have to cook it, you can prepare it while you chat, and there's something for everyone. Just serve it with a slide of Italian or French bread and everybody is happy, very happy. Other healthy options served: Tabouli, baked mushrooms, yogurt spinach/artichoke dip.